eBuddy, a company famous for allowing its users to connect to the world’s most popular instant messaging networks from anywhere in the world, has today announced the worldwide launch of its free real-time messaging app for iOS and Android. The app is a direct competitor to services like Kik and WhatsApp, expanding the capability of a normal text message to provide a fast, secure and reliable messaging service. Having already launched in The Netherlands and Australia, eBuddy XMS borrows on the company’s experience from serving 17 billion instant messages sent via its supported instant messaging protocols each month. eBuddy’s XMS works by utilising a user’s data or WiFi connection to send messages, removing unnecessary SMS charges in the process. Operating similarly to the native apps on their respective platforms, the iOS and Android client will automatically scan a user’s phonebook or Facebook profiles (if granted access) to pull in their friends already using the service. With the worldwide launch happening today, the SMS, email, Twitter or Facebook invitation process might be of more use, at least until the app starts to get traction. When the app is installed, it requires the user to enter the name they wish their friends to see when they interact, but it also requires the user to enter a phone number, which will be used to send a verification code. Whilst the delivery was prompt, we don’t see the need to require a phone number (it’s competitors don’t ask for a number) and it could potentially put people off using the service. eBuddy XMS provides users with the option to personalised the way the application operates, including the ability to view pictures and receive over 100 different emoticons, time-stamping friends interactions to show when they were last online. When in use the app is quick and behaves similarly to the native apps on both Apple and Android devices, structuring messages and alerting the user to the number of unread messages. Push notifications are delivered when messages are sent whilst the user is outside the app, with small visual notifications indicating when messages have been sent, received and read. 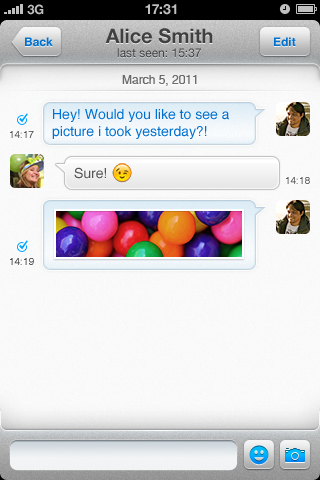 Within the settings is a unique PIN (similar to BlackBerry Messenger) allowing users to quickly add each other without having to use additional networks. The launch comes at a time when smartphone use is continuing to boom and messaging apps are starting to gain rapid adoption over traditional SMS messages. With no carrier interference, messages can be sent all over the world, whether its between friends, family or coworkers, completely free of charge. 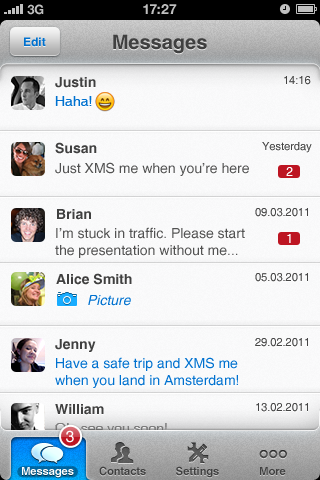 From our use, the eBuddy XMS app is a little more polished than its WhatsApp and Kik rivals. The service is slick, fast and has a different array of ways to add friends, regardless of whether they use the app or not. The company also says that a BlackBerry app is currently in development. To download eBuddy XMS on your iOS or Android device, simply search the App Store or Android Market. Alternatively, you can download the apps via the eBuddy XMS website.